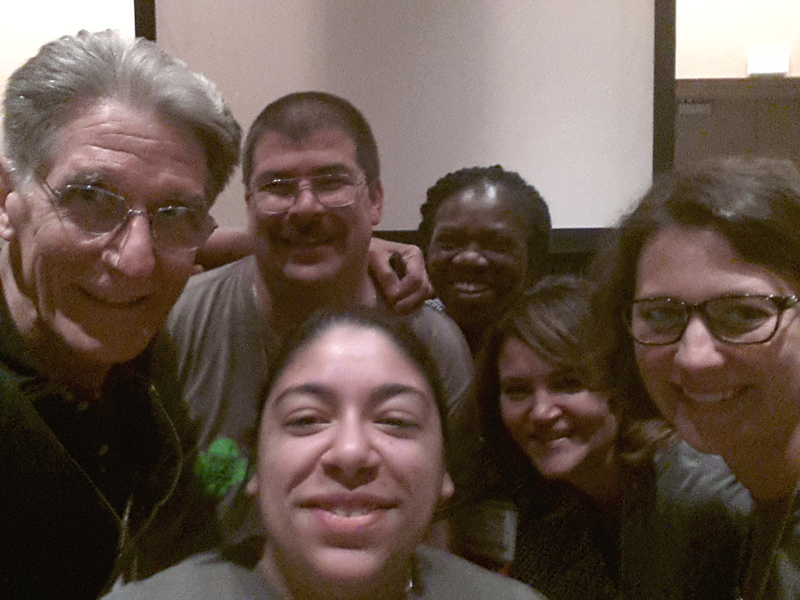 Members of the Mobile CSP team (left-to-right Ralph, Jim, Pauline, Chinma, Chery, and Jen) traveled to Philadelphia on Sunday to host a workshop at ISTE 2015 (International Society for Technology in Education) on building socially useful apps in App Inventor. The workshop was attended by 30+ teachers, all of whom seemed to go away happy. The participants built a version of the Paint Pot app and had fun customizing it in various ways. They also tried one of the CS Principles lessons -- the parity error checking lesson. Jim Veseskis, one of the Mobile CSP teachers from the 2013 cohort, described his experiences teaching the course during the past two years and showed examples of his students' work, including their award-winning Emergency Messenger app. This is an app that nicely exemplifies the course’s “socially useful” them. As the video shows, students in the course took Dave Wolber’s Broadcast Hub tutorial and turned it into an app that the principal uses to alert teachers when there is a school lockdown. To see the entire workshop agenda view our workshop page. One of the goals of the workshop was to recruit teachers from the ISTE community to next summer's (2016) online professional development course. The course is intended for teachers who plan to teach the Mobile CSP course during the 2016-2017 school year. That is the first year that the course will be an official advanced placement (AP) course offered by the College Board. More information about next summer's PD is available here. ISTE (International Society for Technology in Education) is the premier nonprofit organization serving educators and education leaders committed to empowering connected learners in a connected world. ISTE serves more than 100,000 education stakeholders throughout the world. For over 30 years the ISTE Conference & Expo has bringing educators together to learn, exchange ideas and survey the field of education technology. With over 18,000 attendees, ISTE is one of the largest conferences.